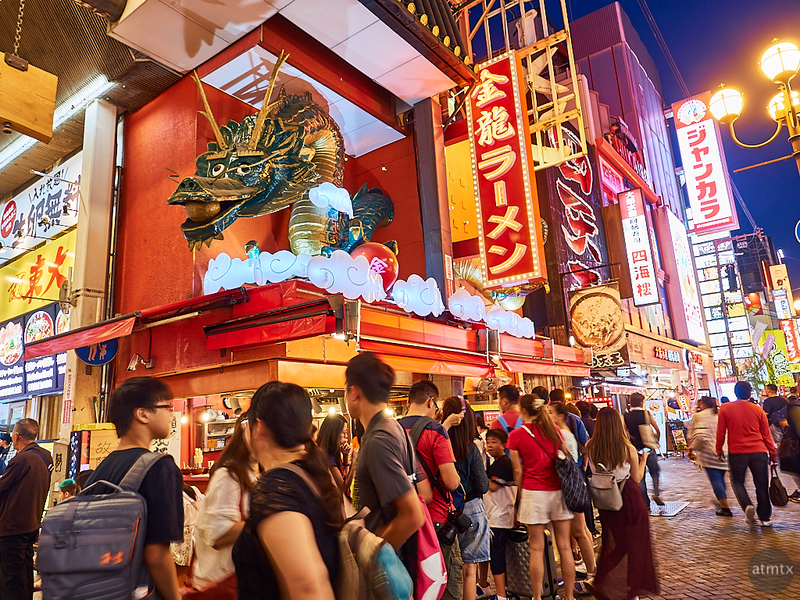 Over the last two posts, you got glimpses of Dotobori, the premier entertainment area in Osaka, Japan. For the third installment, a Photo Essay of the entire area, at night of course, because that’s when it’s the most beautiful and interesting. It plays right into the type of urban night photography that I love and the kind I started with, on this blog. The place gets its name from a nearby canal. 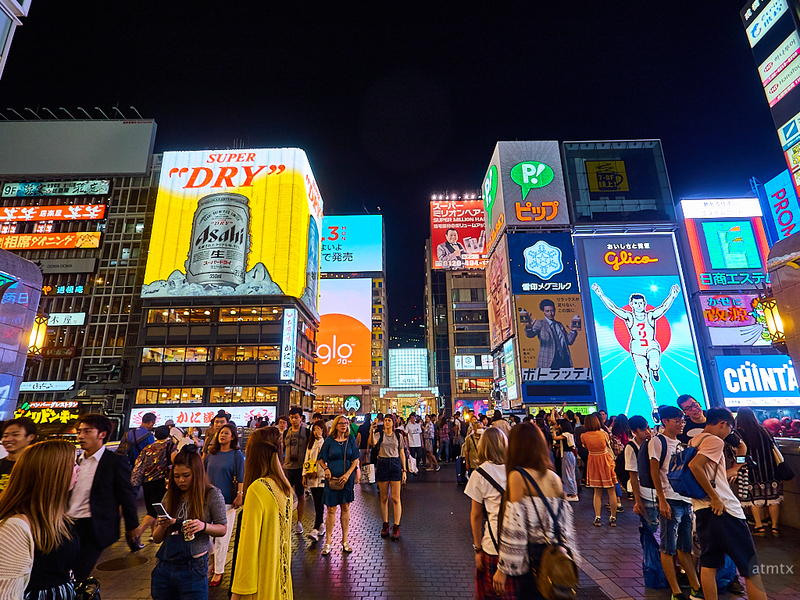 There are two main areas, the bridge that spans the canal is the most popular with a view of the Glico Man, a selfie magnet. Running parallel to the canal, a street packed with restaurants, which is my favorite section, featured above. 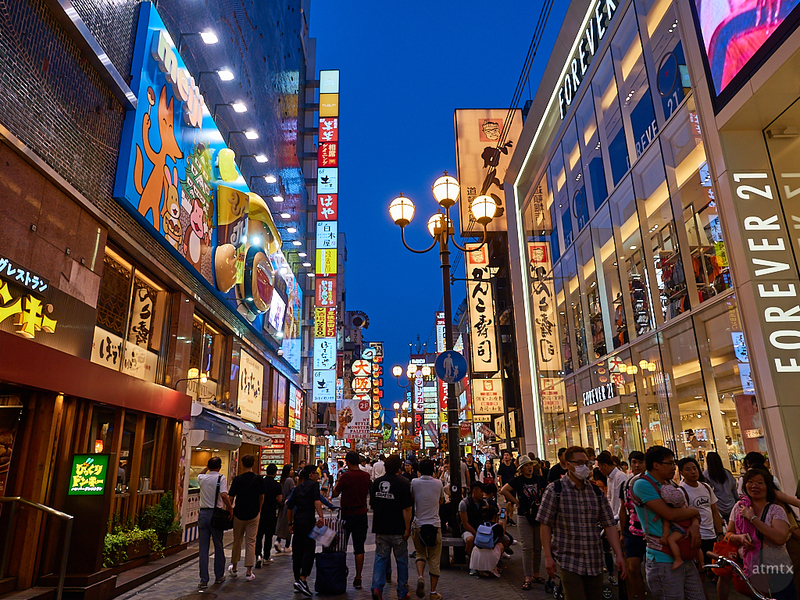 Compared to Tokyo, its larger, more famous neighbor, 300 miles to the east, Osaka is distinctly different. The people are brasher, less conservative and friendlier. It’s a city of merchants and great food. This tacky, kitschy over the top street is a prime example. Tokyo has no equivalent. Parallel to the canal, but on the other side of the bridge, I found this quieter area. Modest and smaller establishments don’t draw as many crowds, but I like the neon signage. 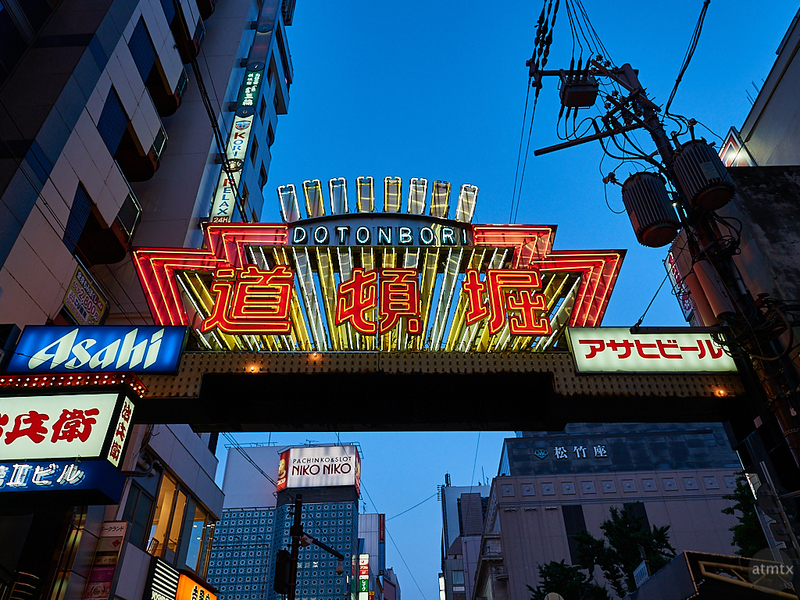 It’s one of the few places I found that actually displays the word Dotonbori in Japanese and English. 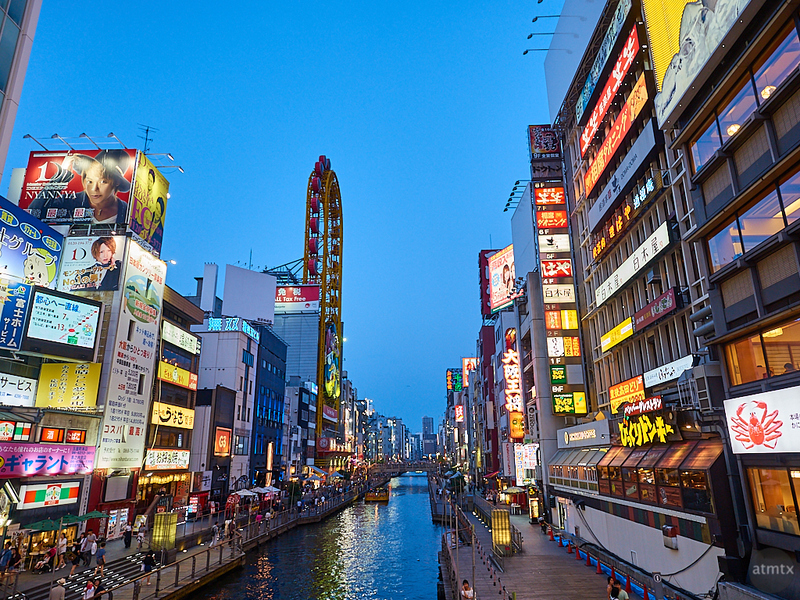 Here’s the actual Dotonbori canal, taken from the bridge. The water appears to be clean and there are nice walkways along its banks. While there’s the occasional boat, it seems like they can do a lot more with it — something akin to San Antonio’s River Walk. On either side of the bridge, large buildings with Neon and Billboards. Most are not very artistic, and certainly these are just large advertisements, but it adds the color and urban visual noise that make this place interesting. 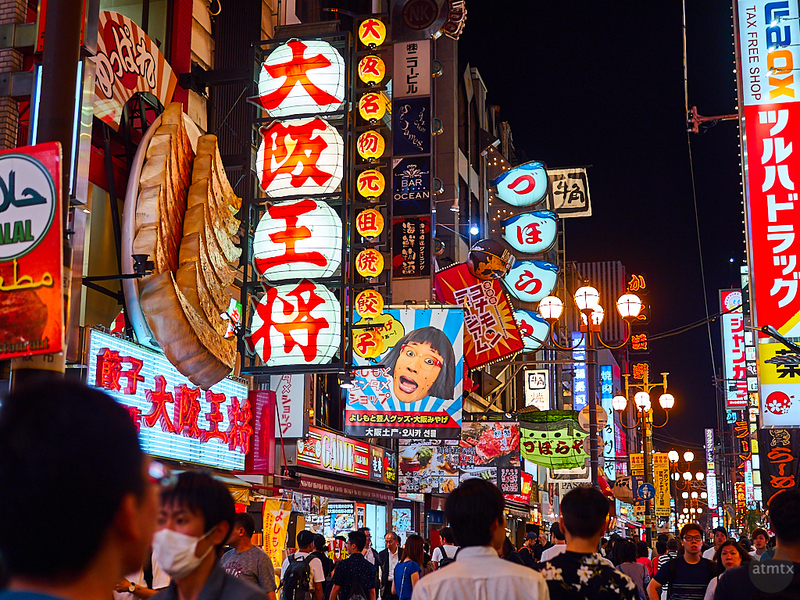 I first saw Dotonbori in a 1989 movie called Black Rain, starring Michael Douglas. I re-watched sections of it today and though dated, much of the flavor remains from the 30-year-old movie. Ridley Scott, the movie’s director, who also made Blade Runner 7 year previous, infused artistic character into this movie shot in Japan. 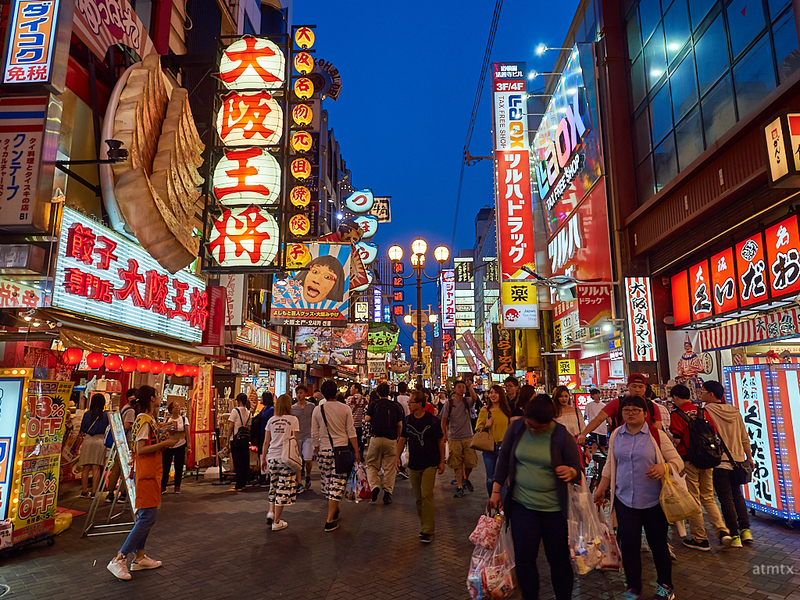 Interestingly, Scott’s portrayal of this area made 1989 Osaka look a bit like the futuristic Blade Runner. Once located next to the bridge and torn down in 2009, the awesome Kirin Plaza building. Its ultra modern design gave that futuristic touch to the movie. Too bad it’s no longer there. Back to my favorite area, packed with restaurants and stores. What makes these restaurants so fun are the “sculptures” hanging from the façade that hints at what they serve. 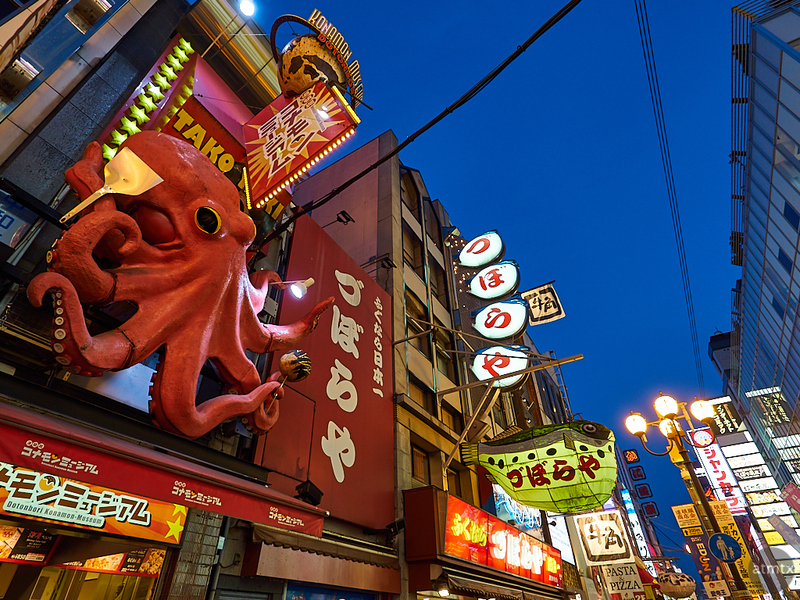 I’ve seen a giant crab, octopus, fish and pot stickers. You might recognize this ramen shop from a couple of days ago, here’s one shot at 1/4 of a second to induce a little motion blur. 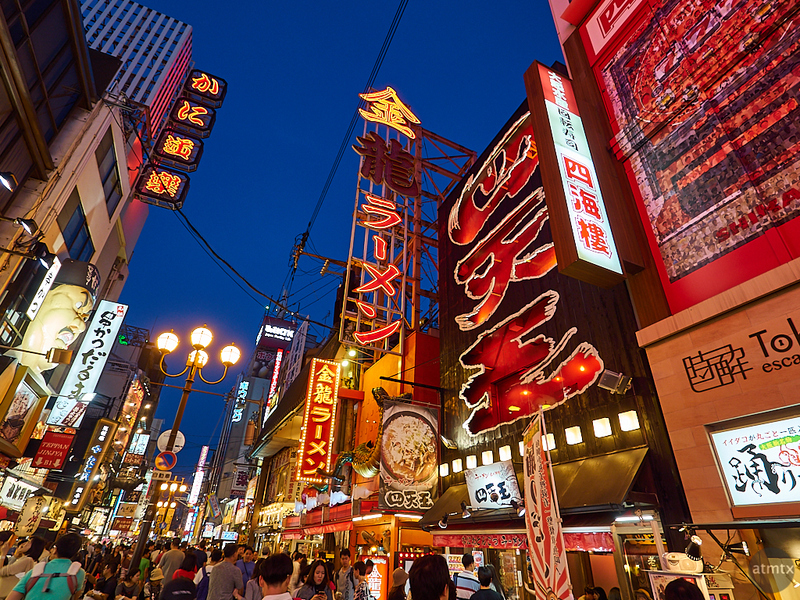 The next picture is the ramen shop from the other side with the bold and large red lettering. This wide-angle gives a good perspective on the area, with the generous pedestrian bridge in the center. 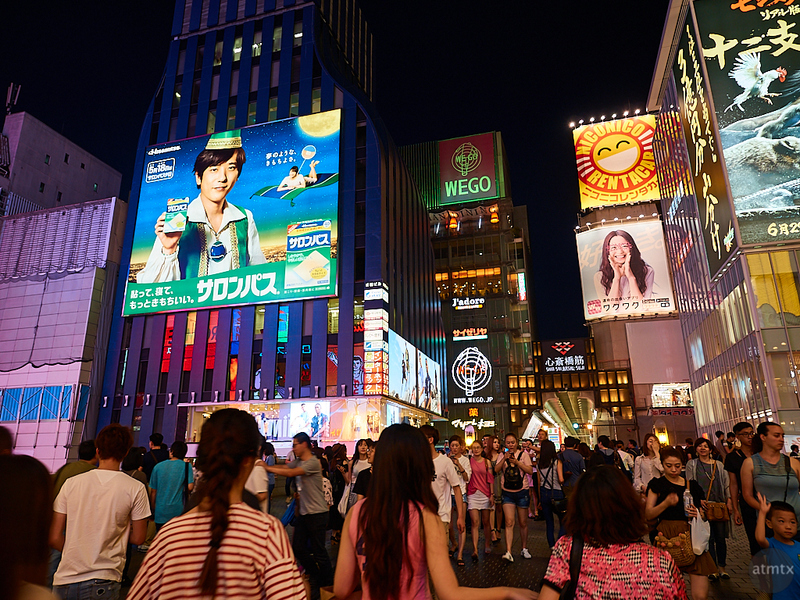 You can see the famous Glico running man sign to the left. 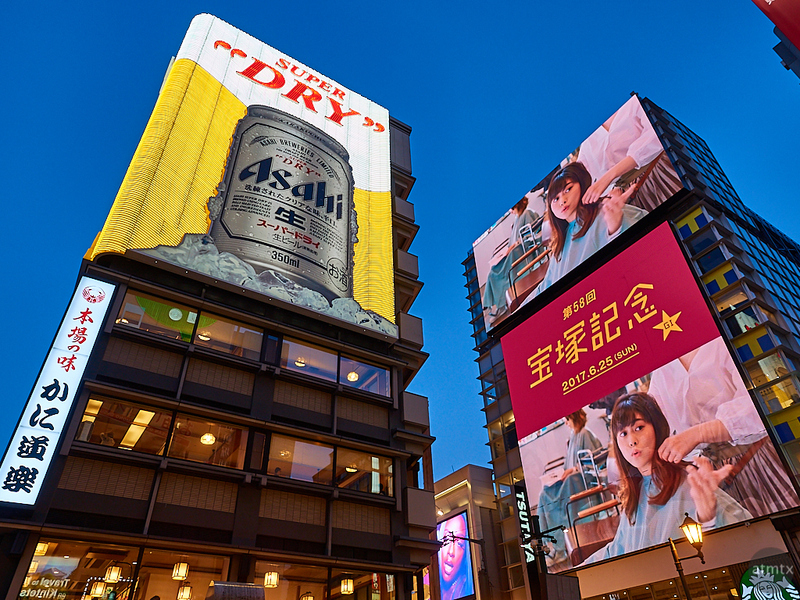 Through the middle and left, passed the Asahi Beer neon, is the restaurant packed street that I like so much. 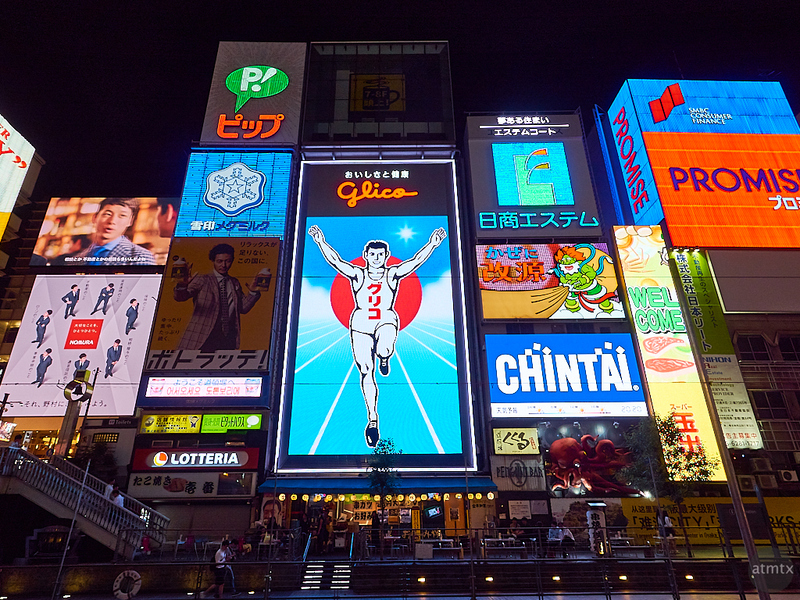 You can see that the Glico sign is one of many completing for attention. But the other signs are boring and they don’t have the history. I’m happy with the dynamic range I got, preserving much of the neon’s color, while still bringing out the shadows. I used the technique to maximize dynamic range and practiced it extensively in Austin, before going to Japan. That allowed me to go without a tripod. Shooting freehand, even at night, was such a great feeling and certainly made the photography that much more enjoyable. Finally, one last image of the cacophonous but visually intriguing restaurant signs. I used a 50mm equivalent to add some visual compression. Which, of course, gives a completely different feel from a super wide-angle. On what basis do you decide on the level of underexposure to use in these type of photos?Was this something you discovered when you started shooting these types of night shots back in April? Great shots, can’t wait to try it on my own. Hi Martin, the level of underexposure is dictated by the highlights. If you know your RAW software can recover some highlights, then you can expose so just the touch of the highlights are overexposed by looking at the histogram or blinking overexposure indicators. If the software doesn’t recovers very little highlights, then expose so that nothing is overexposed. However, you may end up with more shadows and a darker picture, which is not necessarily a bad thing, depending on the mood you are going for. Also, certain things can be overexposed, which is partially an artistic decision. If this is the case you can adjust expose a bit brighter. But in digital, you always error on the side of preserving highlights. Which is the opposite of film where you look more at the shadows. Or, in my less technical head, our software makes overexposing easy, but replacing burned out areas impossible. You can always push highlights, but if you’ve got burned white areas, they stay that way, no matter what you do.